The best things about dose from Karnataka are its names. They actually have ingredients like eerulli (onion) and oodhalu (barnyard millet) only to help people like me doing an A-Z marathon. I lucked out or what! I have made millet dosais and idlis previously but I always added some rice along with it. But this recipe calls for only the millet and lentils with a little of beaten rice. So I was, in equal parts, intrigued and nervous as to how it would turn out. Thankfully I can say it turned out beautifully and the daughter liked it. Can’t ask for anything more! OOdhaly dose, what a brilliant idea to pick this barnyard millet dosa for O. Now i can serve this barnyard millet as Oodhalu dosa as i loved the name of this dosa. Adding poha sounds good. 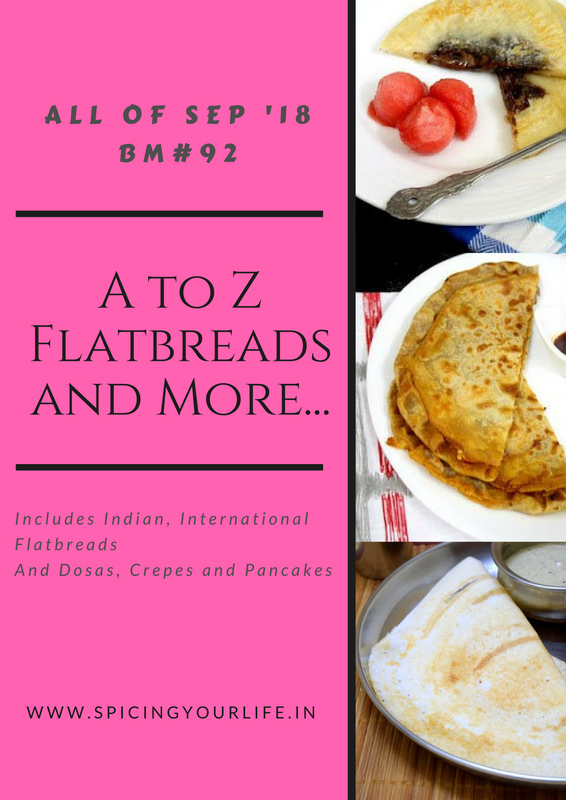 India has some great dishes for difficult alphabets. So I feel the same as you. This millet dosa looks perfectly crisp and kids can never say no to these wonderful dosas. Yes , I feel I should learn a few more languages just for Mega Marathon ! Sometimes we just get stuck . Wonderful pick ! The millets Dosa is such a wonderful one specially when one is on a No Carb Diet ! I know where to stop if I ever want to make a different variety of dosa….your blog. The dosa looks so tempting and its perfectly made. Love it. hahah..see I told you that kannadigas must have either did a series or must have wanted to help souls like us..this is a brilliant pick..and the dosa has turned out stunning!..I have this for the Navratri and will surely make it..too good! Isn’t it fun to know the different names of ingredients in different languages. Love this millet dosai. Look at that texture of the dosai. Great recipe with the millet. Same pinch Sowmya. I too used kannada ingredients for the tough alphabets!And wonderful pick for the alphabet! The dosas have turned out so well Sowmya.